(YA Book Club is the brainchild of writer/blogger Tracey Neithercott. 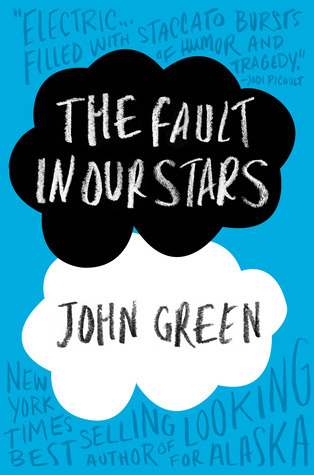 February’s YA Book Club selection is The Fault in our Stars by John Green. From Goodreads – Diagnosed with Stage IV thyroid cancer at 12, Hazel was prepared to die until, at 14, a medical miracle shrunk the tumours in her lungs… for now. Two years post-miracle, sixteen-year-old Hazel is post-everything else, too; post-high school, post-friends and post-normalcy. And even though she could live for a long time (whatever that means), Hazel lives tethered to an oxygen tank, the tumours tenuously kept at bay with a constant chemical assault. Enter Augustus Waters. A match made at cancer kid support group, Augustus is gorgeous, in remission, and shockingly to her, interested in Hazel. Being with Augustus is both an unexpected destination and a long-needed journey, pushing Hazel to re-examine how sickness and health, life and death, will define her and the legacy that everyone leaves behind. First of all, I’m not a huge fan of “cancer books.” I’ve read my fair share, but I don’t love it when authors use illness as a plot device. That said, I found The Fault in our Stars to be incredibly well done–equal parts hilarious and heartbreaking. This is not *just* a cancer book. John Green’s style is so distinct–witty and insightful, with perfectly timed punchlines and just the right amount of emotion. He possesses the ideal narrative voice to tell a story which could have easily been bogged down by sadness and grief. During many of the moments I was overwhelmed by the wretchedness of Hazel and Augustus’s situation, one of them would spout something totally off the wall and hysterical and I’d feel a huge wash of welcome relief. Hazel Grace was a darling protagonist. Her observations about life and love and death were strikingly YA and incredibly profound. At one point she says about Augustus: I fell in love the way you fall asleep: slowly, then all at once… Simple and beautiful and perfect. I would have happily remained in her head for another three-hundred pages. And Augustus… I never thought I’d be attracted to a video-game-obsessed boy with one leg, but yeah… Gus was pretty much a stud. To view him through Hazel’s adoring eyes was a treat. The two of them made one of the most naturally compatible couples I’ve read in YA. While we’re on the subject of amazing TFIOS characters, I have to say: Isaac was freaking awesome. Quite possibly my favorite character of the story. That’s all I’ll say, though, because I believe he should be experienced under a totally fresh, unbiased perspective. Oh, and I also have to give a shout-out to both Hazel and Augustus’s parents. They were incredible–refreshingly involved, anxious, loving, normal moms and dads. Three cheers for fantastic fictional adults! TFIOS doesn’t take the place of Looking for Alaska as my most beloved John Green novel (maybe because Alaska was my first? Maybe because it’s one of the few books to ever make me laugh out loud? Maybe because Miles was just SO uniquely awesome? ), but it was still a wonderful read. Though I didn’t cry (admittedly, I’m not a crier) and I’m not sure I’d put it on a list of my very favorite books, I enjoyed it immensely and I’d definitely recommend it. I mean, it’s John Green… he’s yet to write a book that disappoints. Isaac was my fave, too! I just finished this, too. I agree with what you said about Hazel, Augustus, and Isaac – all great characters! I love the way he gives her his wish (hope that’s not to much of a spoiler) and the way they fall in love despite everything. Great review! Thanks, Kirsten! It was so sweet that Gus gave Hazel his wish. Actions speak loudly, and I think that gesture really showed how deep his feelings for her ran. “He possesses the ideal narrative voice to tell a story which could have easily been bogged down by sadness and grief.” That is so true! I never felt the story veer into melodrama, and it very easily could have. Isaac was such an incredible character. Actually, they all were! They really were. They’re the kinds of characters that will stick with me for a long time–fully formed and layered. Love that about John Green’s work! You know what they say…you never forget your first. Ha! A friend of mine who knows me well–and knows that I AM a crier–recommended that I wait awhile before picking up this book, mostly because I’m still pretty raw from my trip to Haiti. But I’m looking forward to reading it when the time comes. Excellent, thorough review, my dear. As always. And yes, if you’re in a super emotional place it might be best to wait on this one. While there are lots of layers of funny, TFIOS is definitely not a light ready. It’s awesome though, so I hope you’ll get to it eventually! I agree with you on everything. I loved the romance between Hazel and Augustus, and was grateful for the funny moments interspersed with the sadder ones. I also could have read about Hazel and Augustus for many, many more pages. I didn’t like Peter Van Houten either, but I kind of liked the fact that he turned not to be so great. It would have been too convenient if he was who we wanted him to be. He was believable. I was happy his assistant was around though! She was awesome. Looking for Alaska was my first John Green book too. It’s been a while though so I need to re-read it! Yes, I loved Van Houten’s assistant too, especially that she didn’t bother to make excuses for him. She was a welcome relief from his craziness! And you’re right–it would have been really lame if they’d visited him and he’d been a wonderfully generous and helpful man. Still, he rubbed me the wrong way until the end when we learned more about his backstory. And yes, I’m tempted to reread ALASKA too. Love that book! Oh goodness, I think I cried enough tears for the both of us. I cry easily while reading, and while reading this? Total breakdown. I loved it for all of the reasons you mentioned, and I especially loved Augustus. The romance was perfect, the humor necessary and not intrusive, the parents awesome, and Issac such a phenomenal character. It’s definitely one of my favorite books. The romance really was perfect. None of that annoying, unnecessary teen drama that we so often see in YA. Everything between Hazel and Gus felt sincere and genuine. I loved that! I loved Issac and Hazel’s mom. Rebecca talked about Hazel and Gus being hyper-real; I think Issac and the parents were real-real, which helped to balance the narrative. I think you’re right, Laurie. She was a bit of an “every-mom” which was definitely a nice balance to the intensity of most of the other characters. I held hope that I wouldn’t cry because you said you didn’t, but I was in ugly-cry-stuttering-sobs mode for… maybe half the book? 😉 I thought that Isaac was great as well, and for those that think that Hazel and Augustus are maybe too smart or too philosophical, I thought Isaac was a good foil of sorts? I really love ALASKA. If you enjoyed TFIOS, I bet you will too. It’s one of those books that showed me how far YA can push the envelope. Plus, it’s laugh-out-loud funny! “I would have happily remained in her head for another three-hundred pages.” I would have too, her thought process, her kindness, her strength and gosh seeing Augustus through her eyes was definitely a treat! This: ” I never thought I’d be attracted to a video-game-obsessed boy with one leg, but yeah… Gus was pretty much a stud.” Gus WAS a stud. I was so in love with him, from like, the second chapter. He really was very appealing! Before reading, I wondered how John Green would manage a female protagonist and seeing the romantic interest through her eyes. Now that I’ve read, I think he did a fantastic job with it! I loved the HazelxAugustus banter and the friendship between Augustus and Isaac. I think they were all what they needed to be to one another. Does that make sense? Totally makes sense and I agree 100%. That’s what I loved most about the dynamic of all the characters’ relationships. I thought of you last night as I was reading TFIOS Tumblr you blogged about, Jess. Holy crap, did I feel like a dumbass! Apparently I read pretty much solely for entertainment purposes, because most of those questions blew my mind. All of the symbolism and metaphors and poetry references… completely over my head. It was definitely enlightening to read John Green’s answers to the questions. Makes me want to reread the book! I’m really looking forward to reading it one day, but I know that day’s not right now — I don’t have the capacity to handle the sad! And John Green’s too good not to have me in tears. But I’m so, so looking forward to reading it. It’s the same feeling as when you start a series and LOVE the first book — that joy of knowing there’s more. I like knowing that TFIOS is out there waiting for me! Amie, it’s a book you have to be in the right mindset for. While there are plenty of light and funny moments, it’s definitely a book about kids with cancer and there are lots of sad, sad scenes. I hope that when you’re read to read, you enjoy it. I need to read this. Seriously. Great post Katy! Thanks, Lindsay! Hope you enjoy when you get around to reading!